Death Valley Scotty certainly remains Death Valley's greatest legend for his flamboyant and outrageous character. Born Walter Scott in 1872, he ran away as a young boy from his home in Kentucky to join his brother on a ranch in Nevada. He worked numerous jobs in the area, including a few in Death Valley, a place he loved immediately and which would someday become his home. In 1890, a talent scout for Buffalo Bill Cody discovered Scotty and hired him to work as a cowboy with the Wild West show. After traveling the world with the Wild West for twelve years, Scotty began a new profession that brought him even more fame and riches - gold prospecting. 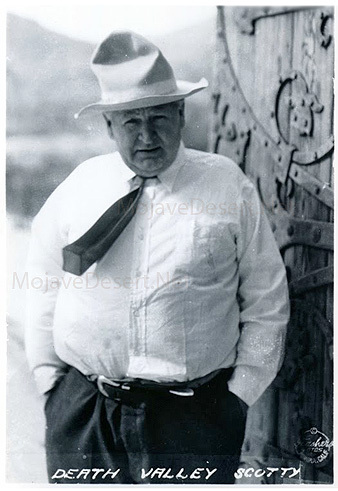 He convinced several wealthy businessmen that he had claim to a gold mine worth a fortune in Death Valley. Scotty agreed to split the profits, provided they first offer enough money to extract the ore.
Scotty apparently had little luck while prospecting in Death Valley over the next few years. However the desert dweller often turned up at the finest hotels and saloons of California and Nevada, and began what would become his legendary spending sprees. Scotty's most steadfast investor was Chicago insurance magnate Albert Johnson. The two men struck quite a contrast to one another when they met soon after the turn of the century. Mr. Johnson was a well respected and religious man, whereas Scotty was a rowdy and shady character. Convinced to invest in the mine, Mr. Johnson gave thousands of dollars to Scotty over the next several years. Unfortunately, at least according to Scotty, a number of calamities prevented delivery of the gold. Undaunted, Mr. Johnson finally decided to take a look at the gold mine on a personal tour of Death Valley. Scotty remained cool. Using his Grapevine Canyon home as base camp, Scotty took Mr. Johnson on a grueling trek by horseback through Death Valley. He figured a few days in the desert would be too much for Johnson, whose health had suffered permanently following a near-fatal train wreck in his youth. Surprisingly, Johnson loved Death Valley so much that he stayed nearly a month, and his health improved dramatically in the dry, sunny climate. Although he never saw Scotty's mine, Mr. Johnson did not seem to mind. He had found riches in the desert far greater than ones that glitter. Besides, he had taken a liking to the eccentric desert rat. The two men began a lifelong friendship that would change the history of Death Valley forever. Over the next ten winters, Albert Johnson often returned to Death Valley. His wife, the former Bessie Penniman, began to accompany him and Scotty on their desert expeditions. 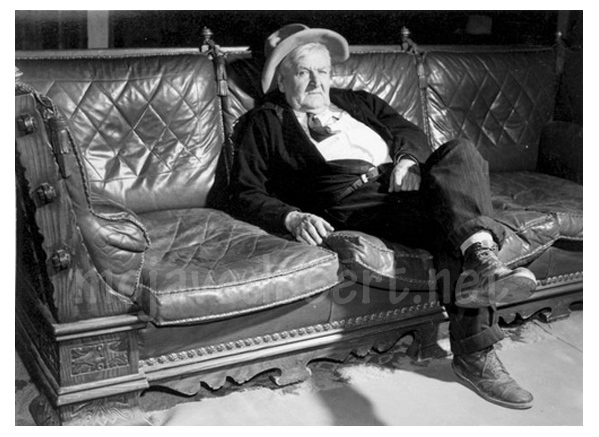 Mrs. Johnson suggested that they build something more comfortable for their vacations, an idea that lead to the construction of the Death Valley Ranch in the late 1920s. Recognizing a good story, Scotty told everyone that he was building the two million dollar home with profits from his gold mine. When questioned by the droves of reporters who visited, Mr. Johnson actually agreed that Scotty owned the place, and passed himself off as Scotty's banker. Towards the end of the Great Depression, the Johnsons retired to Hollywood and often visited the Castle, which had become a popular hotel and tourist attraction due to the fame of Death Valley Scotty. Thousands of tourists, along with reporters from around the country, flocked to the Castle each year to see what they thought to be the dwelling of one of the world's richest gold miners. The Johnsons died in the 1940s, and having no heirs, willed the Castle to a charitable organization called the Gospel Foundation. The Foundation continued to run the Castle hotel and tours, and also took care of Scotty, who lived in the Castle the last two years of his life. He died in 1954, and was laid to rest on a hill overlooking the famous home that bears his name. Death Valley Scotty Special: In July 1905 Walter "Death Valley Scotty" Scott spent $100,000 to rent a four-car train pulled by a steam locomotive in an attempt to break the speed record from the Los Angeles to Chicago. The Sante Fe train made the trip in 44 hours and 54 minutes, a record that stood for thirty years. The Barstow to Needles segment of the run took just 3 hours and 15 minutes. Also known as the Coyote Special.